Here is the teaser for patch 1.1, The Rise of the Rakghouls from Massively and their interview with Gabe Amatangelo. Try a Darth or Jedi Burger? Ready to try a Darth Burger or Jedi Burger…well your wait is over. Now mind you, you will have to travel to Belgium and go to a “Quick” fast food chain for this experience. The two unique burger creations are for the upcoming release of the Star Wars movie, “Phantom Menace” in 3D. 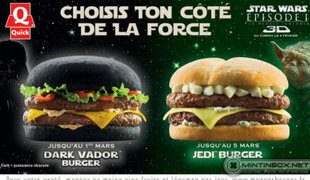 The Darth Burger has to be one of the wildest things at a fast food chain. This burger will feature two beef patties, hot pepper sauce, peppered cheese and has a black bun! Yes, this bun corrupted by the Dark Side. For more about the Darth Burger and the Jedi Burger, check out the article featured in this Yahoo Shine piece. Have you made it to 50 and working to get all your gear or like me and still working to get to your first toon to 50? All of this gaming takes time and not to mention other real world priorities that have kept you from staying caught up on all the news and articles, but don’t worry we have all your favorite Corellian Run Radio articles and news stories from the past week. For your benefit we have them listed below. Seems like we were just talking about PAX Prime and yet PAX East will be here before you know it. In fact, all of PAX East 3 day passes are gone. Now I say all that because Bioware’s David Bass wants your input on events and types of events the SWTOR community is eager to see. In the post & link below, you can read more of what David Bass is asking from you all. This is your time to act and let Bioware know your thoughts. While we haven’t announced the events we’re attending yet, we’ll be present at many of the shows we were at in 2011. We’re also planning on attending a bunch of additional events. What we do at these events will be varied, from having a full booth to doing Community meet-ups and panels, but our goal is to bring The Old Republic to a lot more people – and meet as many of our community as possible throughout the year! With that in mind, we want to hear your thoughts. To get you started, here are some questions we’d love to get your feedback on. What topics would you like to see covered on panels? Specific areas of the game? General roundtables with the developer team? Voice actors? If a show is in your area, would you be likely to attend a Community Meet & Greet outside the show itself? Thanks in advance for all your great feedback! For more information and the thread on how to reply, check out this link to his post. How Fast can you Draw? Cupquake, known for her artwork videos, has created another based on a SWTOR character class. Her artistic talent is amazing. Yes, the video is sped up, but still if I was given an entire year I could never get anything this amazing. Enjoy the art video, put together with some appropriate instrumental music. Check it out and let us know what you think in the comments below. Please try to only respond to this thread by answering these questions, as formatted. This will help us look through the responses much faster. Thank you! 2. Day and time of a 1-2 hour block where you disconnected on average more than once every 15 minutes. (remember to tell us timezone!) We’re looking these up in the logs, so the more specific you can be the better! 3. Have you been receiving the disconnects continually? Are they during particular times of the day? Has it been consistent since launch? Do they tend to group up? 4. How reliably can you reproduce the disconnects? 100%? 75%? 5. Are you on a wired or wireless connection? If wireless, what brand and model of router are you using? 6. Do you share the network connection with others? If so, do they play SWTOR, and have they also experienced disconnects? Are their disconnects at the same time as yours? 7. What version of Windows are you running? Are you running 32 or 64 bit? 8. Are you running any antivirus or firewall programs or any other network filtering program? 9. Would you be willing to be contacted by a BioWare developer and work through some debugging steps hands on with us (most likely via phone)? If so, what timezone are you in? The current situation with end game gear and item modifications isn’t final and, in fact, many community members like yourself have correctly guessed at what our plans to correct the current design are. – All partially moddable purple items will be made fully moddable again, allowing the removal of the armoring, hilt and barrel. – The set bonus of end gear purples (PVP and PVE) will be transferable to custom items. – Some item modifications will be restricted to a certain item type. For example, some item modifications will only fit on helmets, while other will only fit on chests, etc. As usual, the caveats about unfinished work apply, but this should give you and the community a very good idea of our intentions. We are serious about making custom gear an entirely valid alternative to end game gear and we support the players’ ability to customize their appearance all the way to (and including) end game. Georg Zoeller explains the state of the Jedi Knights & Sith Warrior classes…possible changes? 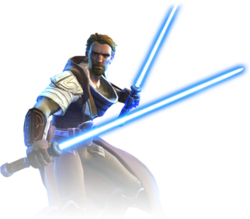 GeorgZoeller Classes -> The Jedi Knight, and Sith Warrior classes need a huge buff. There are many different subjects discussed in this thread and I would like to take the opportunity to give you some information on the topics at hand. First off, we currently have no indication that any class needs a huge buff. Class balance is defined by the interaction between classes and changes we make to one class will, inevitably, move the balance towards or from other classes. Our data and testing currently indicates that the Juggernaut and Guardian AC could use some buffing up in two areas where we see them underperforming against our expectations. Mobility/Anti Kiting (PvP) – We agree with the sentiment voiced by the community that some Guardians and Juggernauts have to work harder than other classes to stay within effective combat range, putting them at a disadvantage. We intend to address this in an upcoming patch where, as a first step, Force Push will clear the cooldown of Force Leap, granting for more reliable in combat pursuit capabilities to the Advanced Class. Further changes will be made if necessary. DPS spec survivability (PvP and PvE) – The DPS specs on Guardian and Juggernaut are performing to our expectations when it comes to the ability to create damage, especially of the burst variety. However their survivability is lagging behind our expectations, especially in the later game, and we are going to start addressing that particular issue in an upcoming patch. Our attention to the class obviously won’t stop here. Balancing MMOs is a never ending endeavor and we’re in for the long haul. For example, we are certainly aware that the Marauder and Sentinel are very gameplay intensive classes with some of the most complex rotations in the game. While we are currently looking at quality of life and usability improvements to increase the class’ playability without compromising the unique aspects of the class, we don’t have anything specific to announce just yet. We do however anticipate that some of the combat responsiveness improvements (AKA ‘ability delay’ – more on that here) being worked on by our engineering team will specifically aid both Marauder and Sentinel. In regards to PvE balance, any place in the game where our data shows significant issues with the balance tuning for one or more classes or specs are of course also being looked at. For example, Jedi Knights will be pleased to hear that we are working on tuning the final mission in their class chain to provide a better, more fun and more reliably solvable challenge (see a post from another member of my team here). Currently a large percentage of players bring a friend to solve this mission, which, while social and often more fun, is not in line with our stated goal of allowing players to progress solo through their class arc if they desire to do so. We’re also looking at some companions with a critical eye to improve their viability for certain role/companion combinations. Now that we’re out of the first few weeks of launch madness, you will see class and combat balance issues addressed with increased frequency. Larger scale gameplay changes and features are more likely to coincide with major content releases, but smaller scale changes and improvements can be expected to become part of our regular update schedule. Statements that we hate a specific class or faction, or that we intentionally underbalance certain classes to make it less popular are conspiracy theory territory. We have nothing to gain from such an approach – we want players to pick the class and faction they want to play and have confidence that they are able to perform their chosen role in the game. Anything that comes in the way of that goal is considered a balance issue for us. We make our balancing decisions based on a combination of internal and external testing and metrics. We don’t make decisions based on who is the loudest on the forums. Community feedback is valuable in bringing issues to our attention and even to highlight possible solutions, which means that well written, constructive posts are the most effective way to communicate your wishes and feedback to us, rather than petitions and calls to nerf specific classes. Please understand that balance issues during the leveling process are different than issues at level 50 and are handled in different ways. If you feel your class has issues during your journey to 50, especially communicate the level range and area of the game where you are experiencing issues to aid our investigations. Player versus Player situations in during the leveling process are not always balanced at every level (a mathematical impossibility), but we are always willing to investigate. Just because we haven’t mentioned the specific issue close to your heart in a post (such as the one above) doesn’t mean we are unaware of it or that we don’t want to address it. It would be impractical for us to comment on all investigations currently in the pipeline. That said, we definitely want to take a more open approach in regards to upcoming class changes. Finally, I’d like to acknowledge, again, that we do understand that there is a desire for players to get more detailed information what happens to their character in combat. We agree with those requests and are working on various ways to, optionally, get more detailed data on your combat performance. That’s all for this week’s HoloNet Links on Corellian Run Radio. Have you come across an interesting, funny, or thought provoking Star Wars Old Republic link, please let me know via email at jason@corellianrun.com, in the comments below, or in the Facebook group. 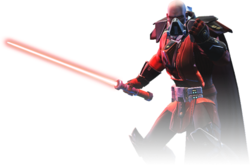 I am always looking for community created artwork, fan fiction and/or videos relating to SWTOR. I will try my best to include any submissions in future HoloNet Links articles. For instance, the video below has something fun for everyone. Hats off to Imperio Latino Guild for this dance celebration after completing Hammer Station. Mind you it is a bit crazy, but it is well done and fits the music selection perfectly and we all need to get excited after achieving any goal. Check it out! I think having a personal DPS meter will allow you (the player) to effectively work out what is the best rotation to maximize your contribution to a raid. Not only this, but it will spark community involvement/conversations (some heated I’m sure) about how to appropriately gear/spec/mod your toon. All of this while at the same time, putting a muzzle on the “donkey”-hats out there whose only form of ego-bruising is spamming meters and verbally abusing those who fall short in there esteemed and learned ways. A personal DPS meter would be great. I didn’t play WoW because anytime I was in a pug some jerk was spewing combat data in party chat. As for the new Flashpoint – Zombies? That’s what their creative comes up with zombies? @ Kevin: My guess on this new Flashpoint (ESPECIALLY considering that it’s landing ~3 weeks after launch), is that initially this was intended for launch, but was held up in development for one reason or another. 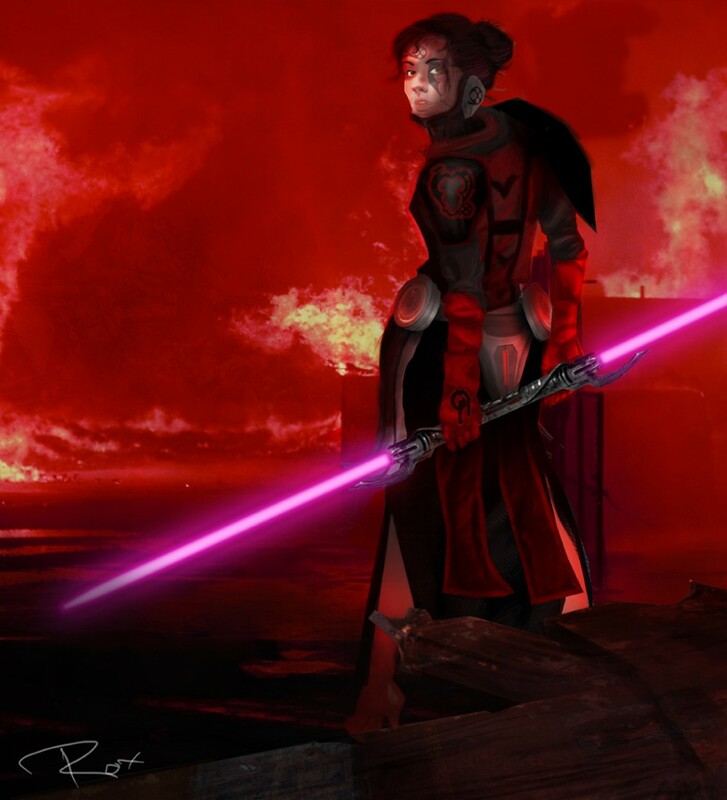 It actually fits with the Taris story-line, as well as something that happened in KotR (which I never played).